Mechanical face seal type 76.90H are precision components made of chilled cast iron. Therefore sharp blows and knocks should be avoided. 1. Keep the seal in the original packaging until just before installation. Once unpacked, be especially careful to protect the fine-finished seal faces of the metallic rings and the elastomeric rings from damage and contamination. 2. The seal housing (a) must be clean and free from machining debris and all edges of the housing bore must be radiused. 3. Install the seal using the special tool (b) and applying pressure directly on the elastomeric ring. For easier assembly, moisten the bore and elastomeric ring with white spirit – not oil or anything similar. 4. Press the seal ring into the housing like a snap fastener. Ensure that afterwards the housing face “G” is parallel to the seal face “D”. The O-rings must not undulate in the housing bore or kink and bulge out of the bore. 5. Before tensioning the seal rings to the setting-up clearance, clean the seal faces and apply a film of oil, preferably with an oil soaked chamois leather cloth. 6. 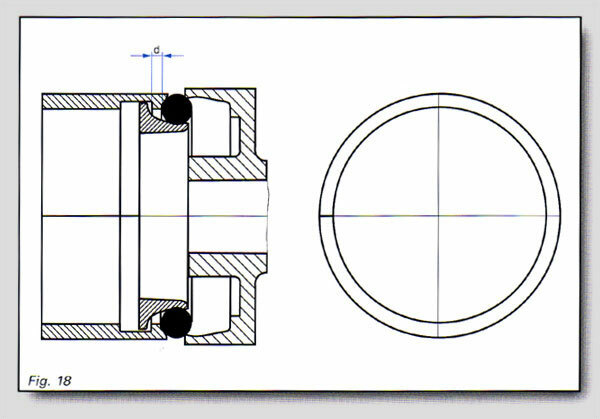 Ensure the clearance between the seal ring housing bores is as specified (see Fig.21). 7. Whether the seal halves should be installed before inserting any adapter rings will be dictated by the constructional design and must be decided by the customer. If the seal set is taken apart in the course of repairs, a new set will have to be installed even if the wear limit is not yet reached. The mating surfaces will have run in on a common line after a relatively short time, and there is no certainty of re-assembling them in exactly the same position. The wear paths of the seal faces would no longer match, and unacceptable leakage would occur until the faces have run in again. A slotted plastic ring, slipped around the seal ring, can be used to aid installation. The step (d) locates between the elastomeric ring and the land of the seal ring. When inserting the seal, pressure is therefore applied directly to the O-ring. Installation tools are currently available upon request. There is no doubt that the seal has far greater application potential when oil with good lubricating and heat dissipating qualities is used, as opposed to grease. Transmission oils, grade SAE 80 and SAE 90, have proved particularly suitable. If necessary, thinner lubricants like engine oil 20 W 20 can also be used. In cases where hydraulic fluids are to be used, our application engineers should be consulted. The oil level after filling should be between the axis centreline and 2/3 of the seal diameter. When filled to the correct level, the oil will generally suffice for the lifetime of the seal. The sealed joint requires no maintenance. Lubrication with grease should be avoided wherever possible, as grease fails to create hydrodynamic lubricating conditions in the seal gap. The result is higher wear and shorter life. Grease may nevertheless be considered for lifetime lubrication, but only up to max = 3 m/s. The seal should on no account be regreased with a grease gun, as the high pressure of the gun can dislodge the O-rings and destroy them. It is also not possible to grease the seal faces, because the seal rings close up as pressure builds internally. Mechanical face seal type 76.90H / 76.97H is designed such that the setting-up clearance A of 3 +/- 0.5 mm will be adequate for the majority of applications (please note special sizes). This dimension determines both the installed position of the seal rings and the compression of the O-rings, i.e. the optimum axial load. The standard clearance of 3 +/- 0.5 mm must be adjusted for applications in which the continuous peripheral speed is between 4 and 10 m/s, in order to prevent excessive loading of the seal faces and heating of the lubricating oil. This can be done by reducing the specific surface pressure at the seal faces by selectively enlarging the clearance A. Reference values for enlargement of the setting-up clearance A are shown in the following chart. As the standard O-ring is designed to a hardness of 60 Shore A, the clearance A must also be adjusted when using O-rings with a hardness > 60 Shore A. In such cases please consult our engineers about the required clearance.